Sometimes, even too much of a good thing can have negative results. 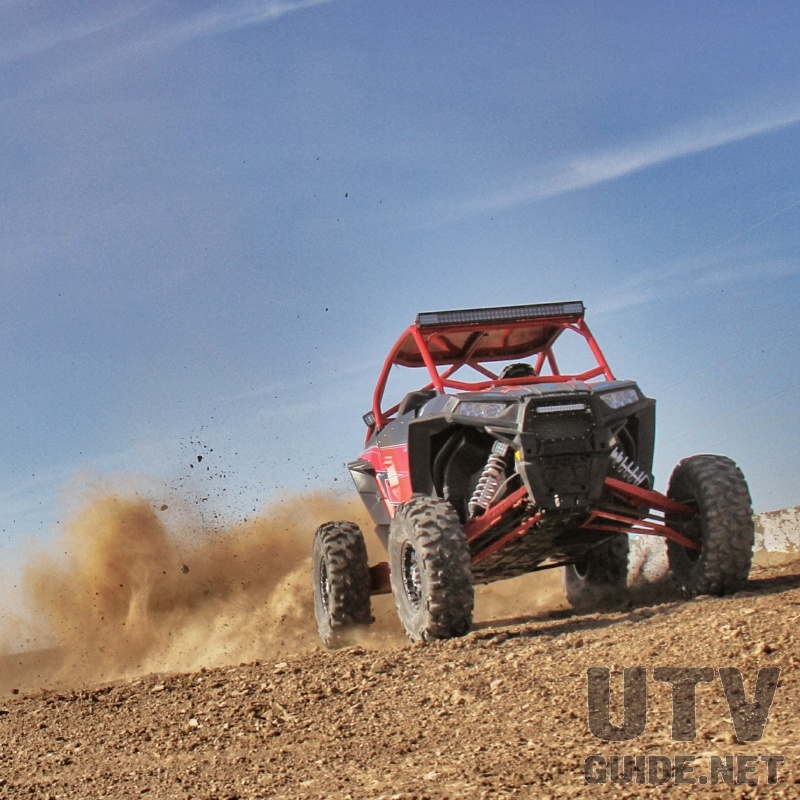 We have gotten behind the wheel of a few UTV builds in the past few years that looked, sounded, and felt fantastic, but weren’t as fun to drive as a bone-stock car. 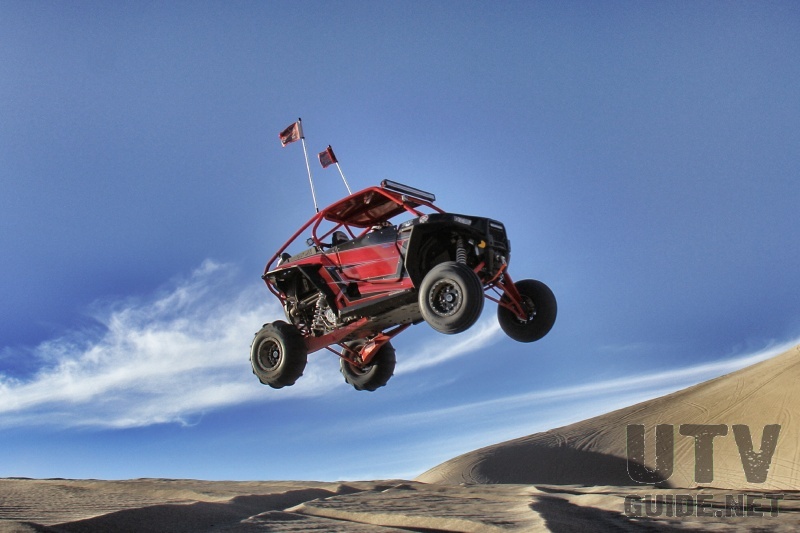 Sure, all the suspension travel and horsepower in the world makes for an exciting ride, but it often detracts from what the OEM engineers worked tirelessly to achieve- balance. 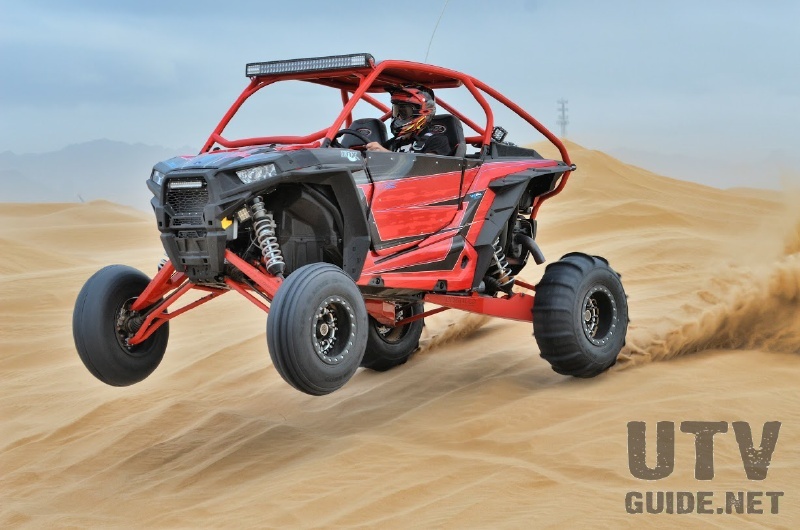 A stock RZR XP1000 is light- it has plenty of power to tow its own weight around, the suspension works very well, and it is reliable. Now we come to our dilemma- we LOVE accessories. As much fun as a stock car can be, the experience only gets better with more of everything. 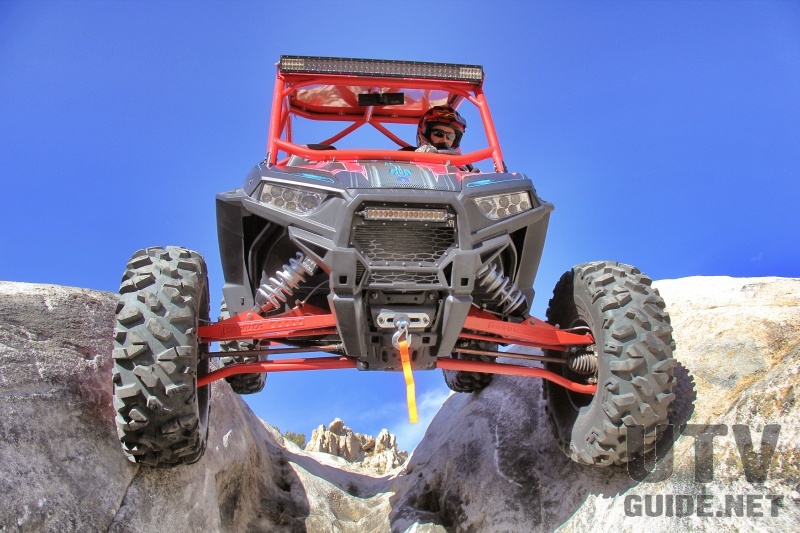 Call us gluttons, but its an internal battle- and the result of this battle is our 2015 RZR XP1000, dubbed the Instigator. Naturally, any car we build has to stand out- besides a first test of a new vehicle, who wants to read about a boring, near-stock machine? 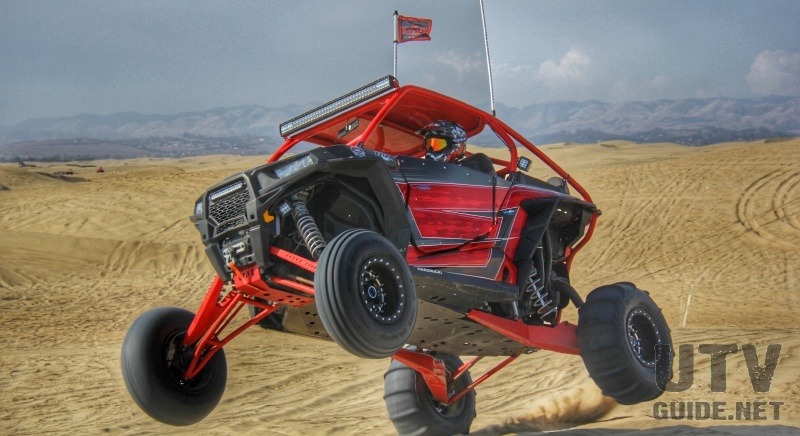 For this reason, we shipped a brand new 2015 RZR XP 1000 to TMW Off-Road in Mesa, Arizona. Upon arrival, the machine had a whopping 4 miles on the odometer, and the TMW crew was thankful that they didnt have to clean any mud or dust out of the car as they started the build. We tried to follow the Keep It Simple, Stupid method with this build, adding accessories that would make the car more enjoyable to live with and not sacrifice its charm. 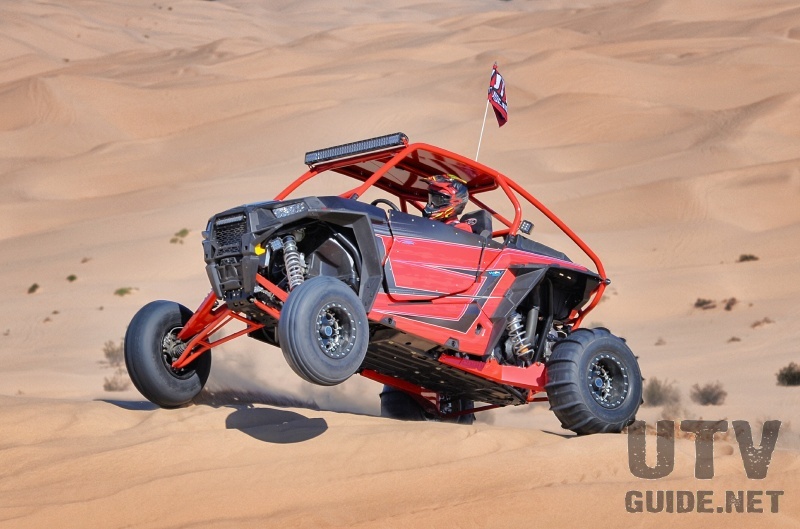 Since the 2015 RZR XP 1000 received a power boost in the form of new engine and clutch calibration, we had a little more wiggle room with adding weight- the extra 10 horsepower and gobs of midrange torque really woke the XP up. 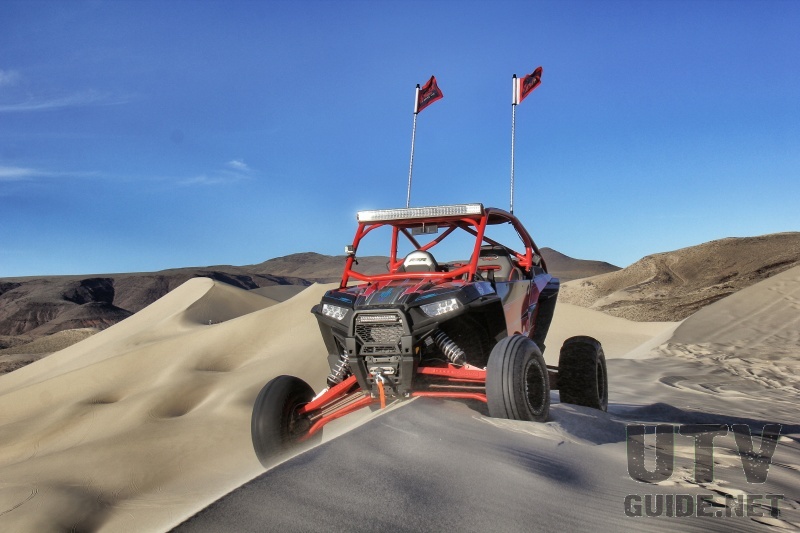 TMW built a lightweight rollcage, front bumper, and full doors, all powdercoated to match the RZRs Havasu Red plastics. We called up our friends at Cognito Motorsports to try out their new Long Travel RZR XP suspension system as well, matching it with a set of incredible Fox steel-bodied internal bypass shocks. 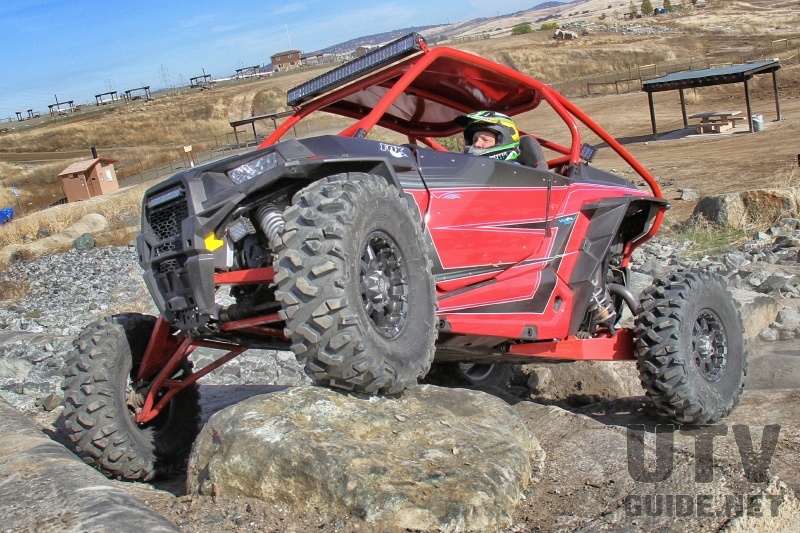 The steel bodies are slightly heavier than the standard aluminum UTV fare, but they hold up to abuse much better. The kit retails for $4,695 without shocks, using a tubular lower A-arm with a boxed upper and boxed trailing arms. 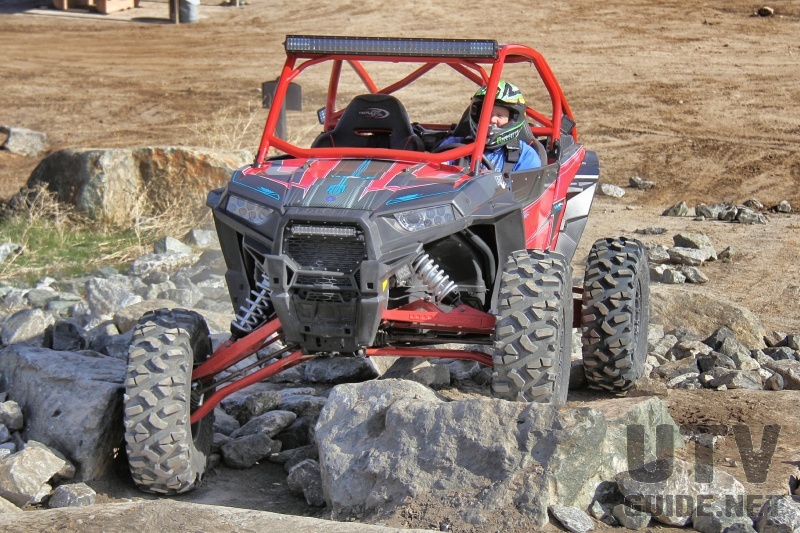 The pieces are lightweight and incredibly strong, and being a +4 kit, it widens the RZR considerably for more cornering and side-hill confidence. TMW also performed all of the accessory installation, including dual SSV Works subwoofers (one in the glove box and one behind the seats), four 6.5 SSV Works speakers, Rigid Industries LED A-series accent lights and D-Series light pods, and a set of Sick Stick LED programmable whips. Once the parts were powdercoated and installed, the whole car was wrapped by the Wolf Designs team, and they designed an elegant, beautiful design for the Intigator. Wolf Designs sells kits you can apply yourself as well as full-coverage wraps that get about as close to a custom paint job as we have seen. Axia Alloys provided a fire extinguisher mount, and panoramic mirror for a little safety and visibility. Triple X took care of the occupant containment, using their incredibly comfortable Venom seats. The seats are far more comfortable than the stock units and offer much more support for spirited driving. Topping off the interior packaging is a set of Simpson Racing harnesses. 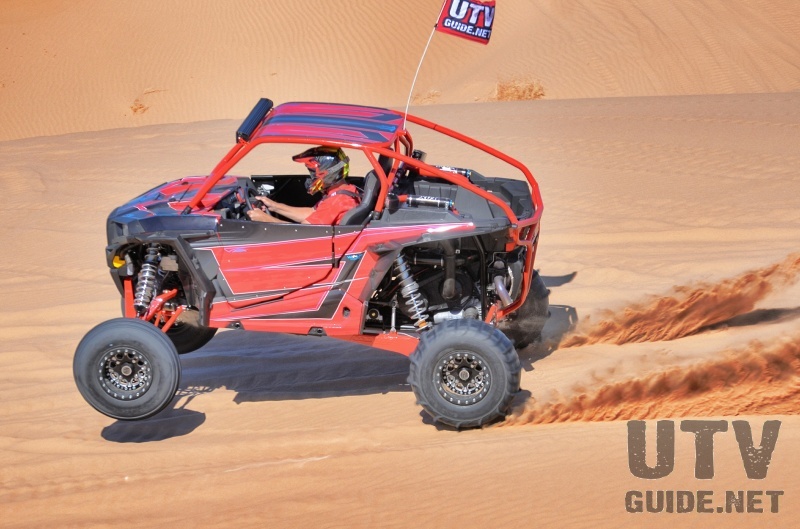 Simpson has been in the harness game far longer than UTVs have existed, and they built a fantastic product. 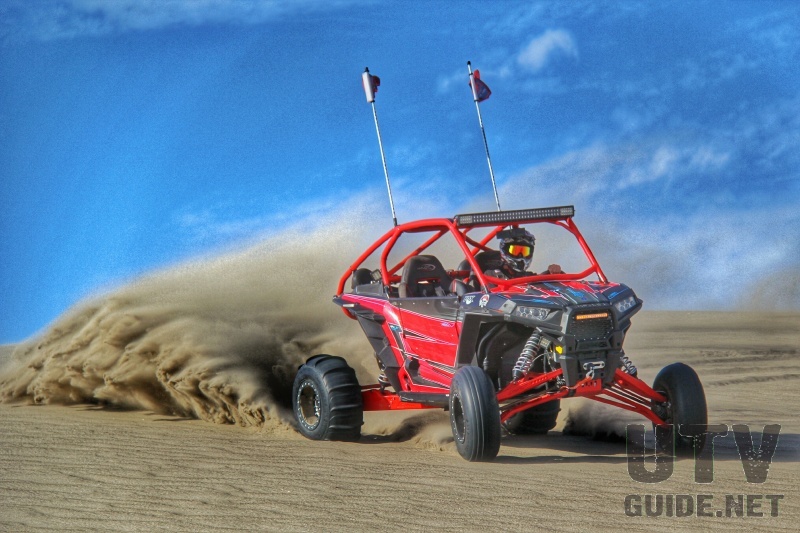 Our first outing with the car was in Glamis for Camp RZR earlier this year, where we wrapped a set of STU paddles from Fullerton Sand Sports around a gorgeous set of HiPer Fusion beadlock wheels, which are a mix of aluminum and carbon fiber composite for light weight and incredible strength. 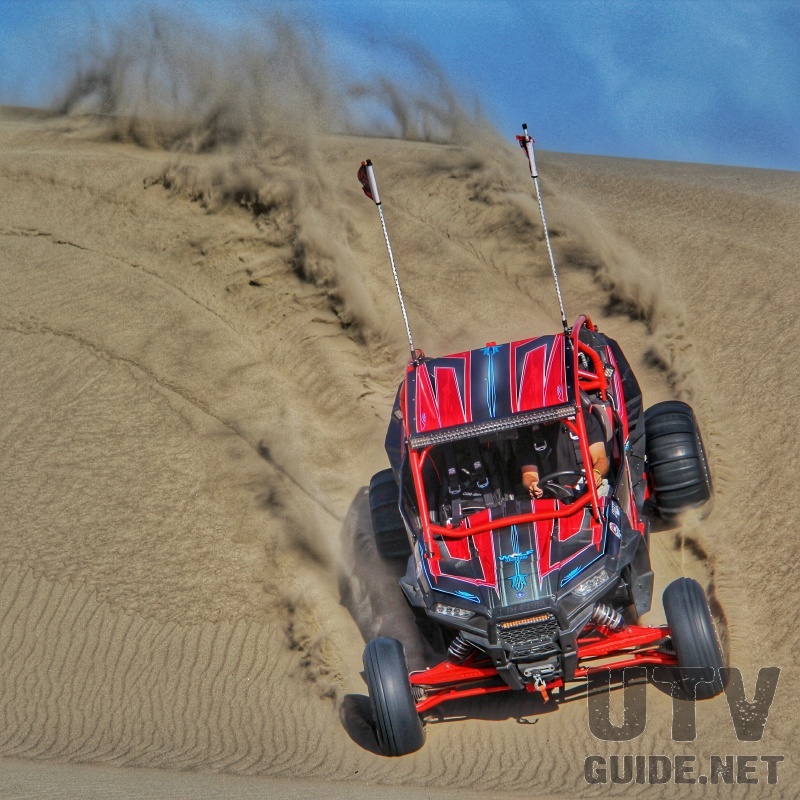 The car was an absolute blast to drive in the dunes, but the shocks were a little soft for our taste, so we worked with Cognito to revalve the huge FOX internal bypass units for a little more bottoming resistance. After taking the car to the dunes, we had to run to the rocks- after all, the Rubicon is our backyard! 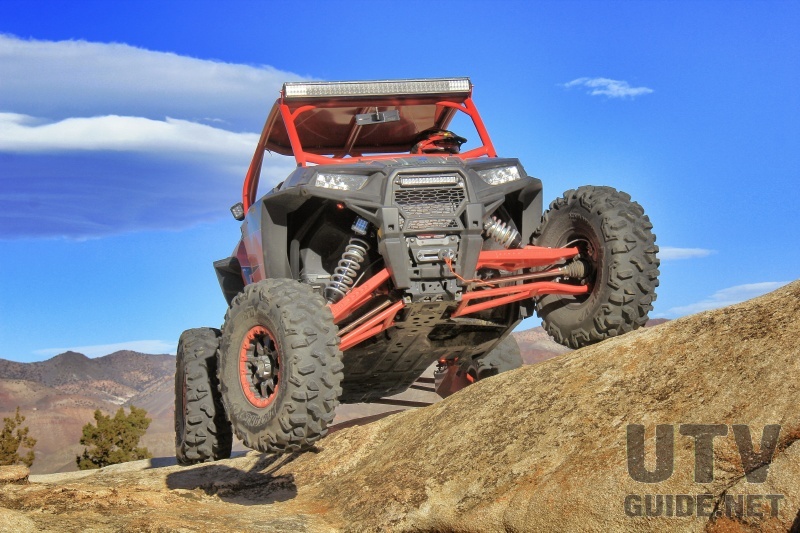 We added a set of nearly bulletproof UTV Tech skid plates to keep the underbelly of the car safe from boulders and trail debris, as well as a set of STI HD5 beadlock wheels and 32 Roctane XD tires. To deal with the added tire mass, we contacted EPI Performance for a clutch kit, as well as Queen Racing for an ECU reflash. With the clutch kit and ECU reflash done, the car felt just as quick as stock, even with the added weight of the cage, doors, stereo, and long travel kit. Turning the big 32 tires wasnt an issue for the XP! 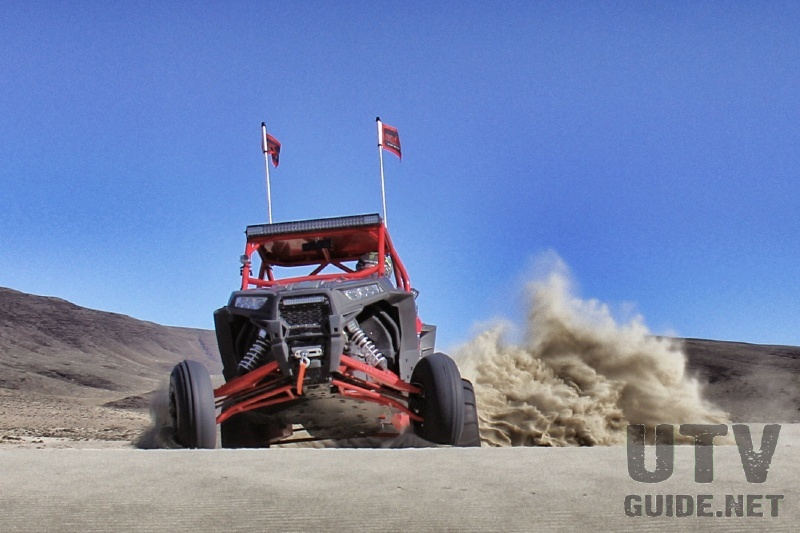 The long-travel suspension really helps get the wheels down into obstacles in the rocks, and the car will effortlessly float over obstacles and hard climbs in 4 Low without so much as a hiccup. The Fox shocks are extremely adaptable- we were able to loosen up the compression and rebound to soften the ride in the rocky stuff and tighten them right back up for high-speed desert and sand trips, never having to swap setups between the two. Cognito and FOX have a very dialed package that turns the XP into a terrain-devouring monster, while providing increased reliability of the suspension pieces, including tie rods and radius rods. In pursuit of building an accessorized car that remained lightweight and fun to drive, we believe we hit the nail on the head. The SSV Works stereo provides bumping tunes whether youre railing dunes, crawling over rocks, or relaxing around the campfire. 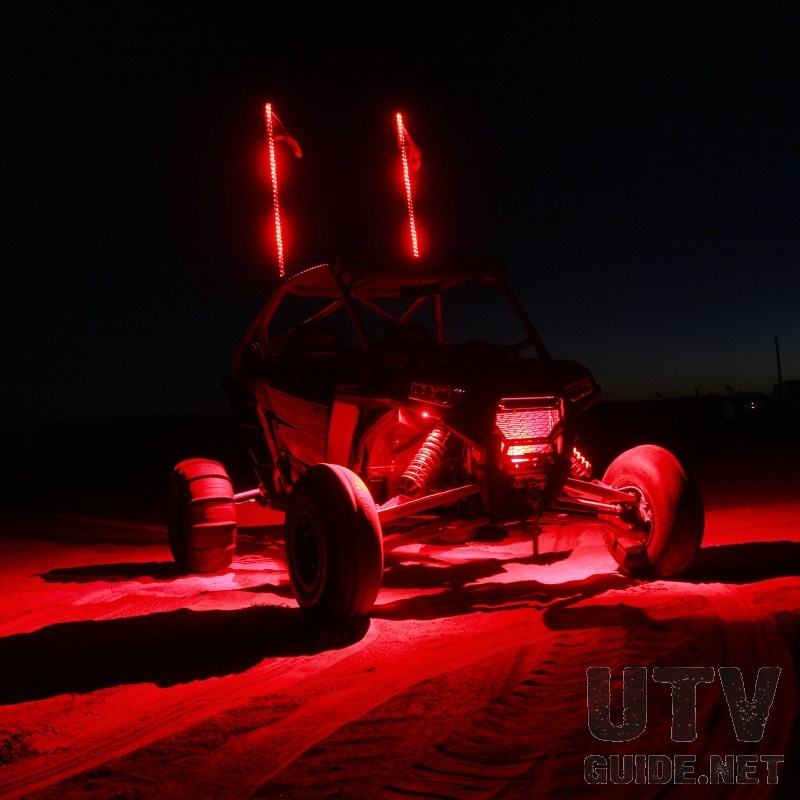 TMW and Wolf Designs created a look for the car that really turns heads, especially with the Rigid accent lighting and Sick Stick LED whips lit up at night. 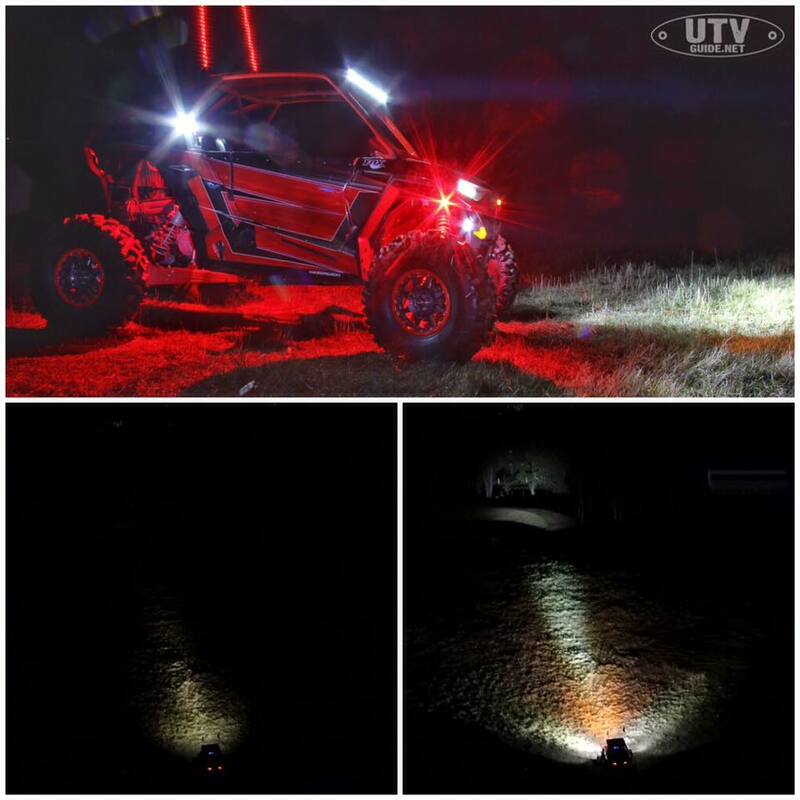 The whips are programmable with 7 colors and over 300 patterns, so we can mount them to any car in our stable and color-match the whip lights. We often find ourselves debating which cars to take on trips, and the Instigator always makes its way into the trailer. We have achieved the balance we were looking for- a light-weight, simple build with enhanced performance and a killer look. 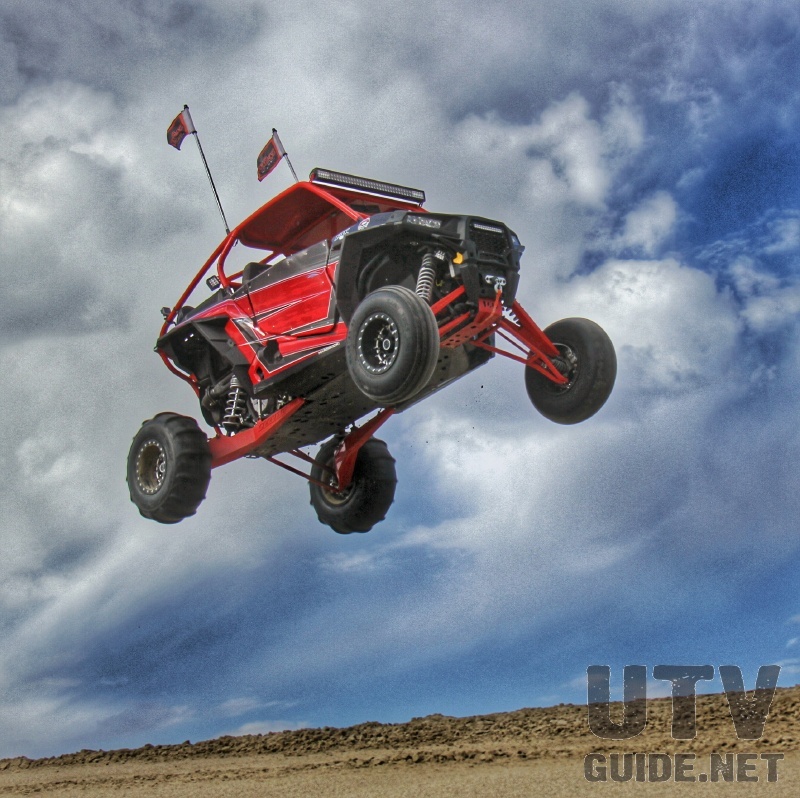 So if youre debating on how to build your UTV, give one or all of these great companies a call, and make sure to tell them UTV Guide sent you!